Now that you've read the results and seen the video in NSDN's Daily Race Coverage from Primm here are some photos from the race. These photos were taken by our friends at C3 Productions and are available for purchase. C3 Productions may be contacted through www.c3productions.net. Sunday was a day for the record books at the Primm Valley Resorts NSDA Nationals. Dennis Rieck took home the Top Fuel title and in the process set a new world E.T. record with a 2.327 backed up by an earlier 2.353. Shane Sanford emerged victorious in Top Alcohol taking the victory by .006 over Dan Allen in the final round. Jeff Mamer won a double breakout decision over D.L. 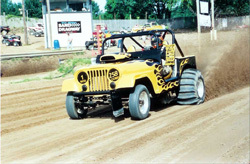 King in an all four-cylinder Top Eliminator final round. Winners in the day’s bracket classes were: George Amos (Pro 1), Don Boespflug (Pro 2), Tom Hartman (Pro 3), Ian Brown (MC Pro 1), and Jake Russell (MC Pro 2). 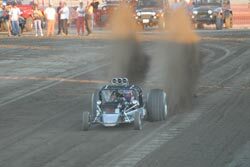 September was another great month of sand drag racing with large events across the country. In September, we had event coverage from the NSDA at San Jacinto, WMSD, Thunder Valley, Atoka, and last but not least Albright Shores. I was fortunate enough to be able to attend and race at the Show Me the Money event at Albright Shores Sand Drags in Eastern Michigan. After a long season, this was exactly the type of race that the large contingent of WMSD racers that showed up needed. The hospitality was second to none and the laid back atmosphere was greatly appreciated. Thanks goes out to the crew that worked hard all weekend to keep the race moving along. I n my opinion there are two kinds of families; those that race and those that don’t. That’s probably pretty shallow, but that’s how I see it. Fortunately, I’ve always been in the “families that race” category. I’ve grown up in this sport and I attribute a lot of my current life to the way I grew up. After one of our big races we decided to take a few weekends off just to catch up around the house. My wife had an important business trip upcoming in Chicago where she needed to buy a few new business suits. So one Saturday afternoon, off we went to the local mall. It’s a rarity for us to be home on a Saturday, let alone spending it a mall. We’re not really the mall going type of family. Now don’t get me wrong. We don’t look like Clampetts arriving in Beverly Hills when we go into town. We actually play the part of the suburban family quite well. It’s just not our thing to be inside a mall when there is a perfectly good race to be at. This column writing thing always amazes me. One month I write what I feel is a really good column and I get no responses what so ever. Sometimes it seems to be “weaker” so to speak and the response is surprising. Last month was one like that. I really wanted to put more in the column, but I didn’t want to be long winded. I had some great responses though. One reader told me that they would not even unload their race car to race for a trophy, much less pay $35 on top of that. Others told me about racing for nothing more than the respect of the other racers. Is one to be held more highly than another? No way, different strokes for different folks I guess, but deep down, we all have our own reasons, plain and simple. 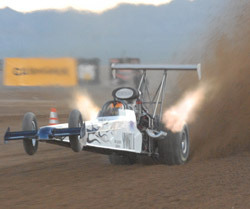 The NSDA held its fifth points series race of the season at the Soboba Casino in September. Action was very competitive as the west coast racers knocked off the rust from the summer break. This time around we’ll take a little different approach to a race recap and highlight the news makers through photos. All photos in this recap were taken by our friends at C3 Productions and can purchased from them at www.c3productions.com . 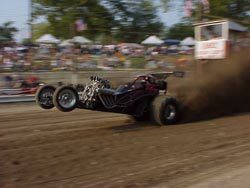 Albright Shores Sand Dragway held their annual end of the season “Show Me The Money” race September 28-30. This year’s race saw a big showing of West Michigan Sand Dragway and Albright Shores regulars making it quite an event for the spectators.